"Karl I" redirects here. For the Prince of Liechtenstein, see Karl I of Liechtenstein. Charles I (Karl Franz Joseph Ludwig Hubert Georg Otto Marie von Habsburg-Lothringen, English: Charles Francis Joseph Louis Hubert George Otto Mary of Habsburg-Lorraine, Hungarian: IV. Kx�roly or Kx�roly Ferenc Jx�zsef, Italian: Carlo Francesco Ludovico Giorgio Ottone Maria d'Asburgo Lorena, Polish: Karol Franciszek Jx�zef Ludwik Hubert Jerzy Otto Maria Habsbursko-Lotaryński, Ukrainian: Карл І Франц Йосиф) (17 August 1887 - 1 April 1922) was (among other titles) the last ruler of the Austro-Hungarian Empire. He was the last Emperor of Austria, the last King of Hungary, the last King of Bohemia, Croatia and the last King of Galicia and Lodomeria and the last monarch of the House of Habsburg-Lorraine. He reigned as Charles I as Emperor of Austria and Charles IV as King of Hungary from 1916 until 1918, when he "renounced participation" in state affairs, but did not abdicate. He spent the remaining years of his life attempting to restore the monarchy until his death in 1922. Following his beatification by the Catholic Church, he has become commonly known as the Blessed Charles of Austria. Karl was born on 17 August 1887, in the Castle of Persenbeug in Lower Austria. He was the son of Archduke Otto Franz of Austria (1865-1906) and Princess Maria Josepha of Saxony (1867-1944); he was also a nephew of Archduke Franz Ferdinand of Austria-Este. As a child, Charles was reared a devout Catholic. 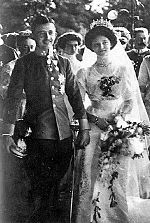 In 1911, Charles married Princess Zita of Parma. Charles became heir-presumptive with the assassination of Archduke Franz Ferdinand, his uncle, in Sarajevo in 1914, the event which precipitated World War I. Karl's reign began in 1916, when his grand-uncle, Franz Josef I of Austria died. Karl also became a Generalfeldmarschall in the Austro-Hungarian Army. 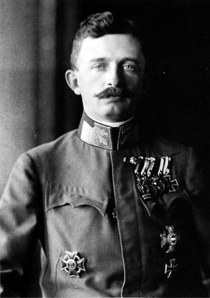 On 2 December 1916, he took over the title of Supreme Commander of the whole army from Archduke Frederick. His coronation occurred on 30 December. In 1917, Charles secretly entered into peace negotiations with France. Although his foreign minister, Ottokar Czernin, was only interested in negotiating a general peace which would include Germany as well, Charles himself, in negotiations with the French with his brother-in-law, Prince Sixtus of Bourbon-Parma, an officer in the Belgian Army, as intermediary, went much further in suggesting his willingness to make a separate peace. When news of the overture leaked in April 1918, Charles denied involvement until the French Prime Minister Georges Clemenceau published letters signed by him. This led to Czernin's resignation, forcing Austria-Hungary into an even more dependent position with respect to its seemingly wronged German ally. Foreign Minister Baron Istvan Burix�n asked for an armistice based on the Fourteen Points on 14 October, and two days later Charles issued a proclamation that radically changed the nature of the Austrian state. The Poles were granted full independence with the purpose of joining their ethnic brethren in Russia and Germany in a Polish state. The rest of the Austrian lands were transformed into a federal union composed of four parts-German, Czech, South Slav and Ukrainian. Each of the four parts was to be governed by a federal council, and Trieste was to receive a special status. However, Secretary of State Robert Lansing replied four days later that the Allies were now committed to the causes of the Czechs, Slovaks and South Slavs. Therefore, autonomy for the nationalities was no longer enough. In fact, a Czechoslovak provisional government had joined the Allies on 14 October, and the South Slav national council declared an independent South Slav state on October 29, 1918. The Lansing note effectively ended any efforts to keep the Empire together. One by one, the nationalities proclaimed their independence; even before the note the national councils had been acting more like provisional governments. Charles' political future became uncertain. On 31 October, Hungary officially ended the personal union between Austria and Hungary. Nothing remained of Charles' realm except the Danubian and Alpine provinces, and he was challenged even there by the German Austrian State Council. His last prime minister, Heinrich Lammasch, advised him that it was fruitless to stay on. 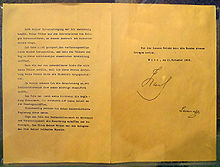 On 11 November 1918-the same day as the armistice ending the war between allies and Germany-Charles issued a carefully worded proclamation in which he recognized the Austrian people's right to determine the form of the state and "relinquish(ed) every participation in the administration of the State." He also released his officials from their oath of loyalty to him. On the same day the Imperial Family left Schx�nbrunn and moved to Castle Eckartsau, east of Vienna. On 13 November, following a visit of Hungarian magnates, Charles issued a similar proclamation for Hungary. Although it has widely been cited as an "abdication", that word was never mentioned in either proclamation. Indeed, he deliberately avoided using the word abdication in the hope that the people of either Austria or Hungary would vote to recall him. I did not abdicate, and never will. (...) I see my manifesto of 11 November as the equivalent to a cheque which a street thug has forced me to issue at gunpoint. (...) I do not feel bound by it in any way whatsoever. Picture - The declaration of 11 November 1918. Instead, on 12 November, the day after he issued his proclamation, the independent Republic of German Austria was proclaimed, followed by the proclamation of the Hungarian Democratic Republic on 16 November. An uneasy truce-like situation ensued and persisted until 23 March 1919, when Charles left for Switzerland, escorted by the commander of the small British guard detachment at Eckartsau, Lt. Col. Edward Lisle Strutt. As the Imperial Train left Austria on 24 March, Charles issued another proclamation in which he confirmed his claim of sovereignty, declaring that "whatever the national assembly of German Austria has resolved with respect to these matters since 11 November is null and void for me and my House." Although the newly-established republican government of Austria was not aware of this "Manifesto of Feldkirchen" at this time (it had been dispatched only to the Spanish King and to the Pope through diplomatic channels), the politicians now in power were extremely irritated by the Emperor's departure without an explicit abdication. On 3 April 1919, the Austrian Parliament passed the Habsburg Law, which permanently barred Charles and Zita from ever returning to Austria again. Other Habsburgs were banished from Austrian territory unless they renounced all intentions of reclaiming the throne and accepted the status of ordinary citizens. Another law, passed on the same day, abolished all nobility in Austria. In Switzerland, Charles and his family briefly took residence at Castle Wartegg near Rorschach at Lake Constance, and moved to Chx�teau de Prangins at Lake Geneva on 20 May 1919. Encouraged by Hungarian royalists ("legitimists"), Charles sought twice in 1921 to reclaim the throne of Hungary, but failed largely because Hungary's regent, Miklx�s Horthy (the last admiral of the Austro-Hungarian Navy), refused to support him. Horthy's failure to support Charles' restoration attempts is often described as "treasonous" by royalists. Critics suggest that Horthy's actions were more firmly grounded in political reality than those of Charles and his supporters. Indeed, the neighbouring countries had threatened to invade Hungary if Charles tried to regain the throne. Later in 1921, the Hungarian parliament formally nullified the Pragmatic Sanction--an act that effectively dethroned the Habsburgs. 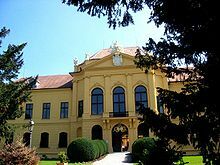 After the second failed attempt at restoration in Hungary, Charles and the pregnant Zita were briefly quarantined at Tihany Abbey. On 1 November 1921 they were taken to the Danube harbor city of Baja, made to board the British monitor HMS Glowworm, and were removed to the Black Sea where they were transferred to the light cruiser HMS Cardiff. They arrived in their final exile, the Portuguese island of Madeira, on 19 November 1921. Determined to prevent a third restoration attempt, the Council of Allied Powers had agreed on Madeira because it was isolated in the Atlantic and easily guarded. Originally the couple and their children (who joined them only on 2 February 1922) lived at Funchal at the Villa Vittoria, next to Reid's Hotel, and later moved to Quinta do Monte. Compared to the imperial glory in Vienna and even at Eckartsau, conditions there were certainly impoverished, although not nearly comparable to the bleak conditions under which most of Charles' former subjects had to make a living after the war. During his stay on the island, his personal chaplain was the priest, Father Jorge de Faria e Castro. Charles would not leave Madeira again. On 9 March 1922 he caught a cold walking into town and developed bronchitis which subsequently progressed to severe pneumonia. Having suffered two heart attacks he died of respiratory failure on 1 April in the presence of his wife (who was pregnant with their eighth child) and 9-year old Crown Prince Otto, retaining consciousness almost to the last moment. His remains except for his heart are still kept on the island, in the Church of Our Lady of Monte, in spite of several attempts to move them to the Habsburg Crypt in Vienna. His heart, and that of Empress Zita, repose in the Loreto Chapel of Muri Abbey. "Emperor Karl is the only decent man to come out of the war in a leadership position, yet he was a saint and no one listened to him. He sincerely wanted peace, and therefore was despised by the whole world. It was a wonderful chance that was lost." "He tried to compensate for the evaporation of the ethical power which emperor Franz Joseph had represented by offering ethnical reconciliation. Even as he dealt with elements who were sworn to the goal of destroying his empire he believed that his acts of political grace would have an impact on their conscience. These attempts were totally futile; those people had long ago lined up with our common enemies, and were far from being deterred." Catholic Church leaders have praised Charles for putting his Christian faith first in making political decisions, and for his role as a peacemaker during the war, especially after 1917. They have considered that his brief rule expressed Roman Catholic social teaching, and that he created a social legal framework that in part still survives. From the beginning, the Emperor Charles conceived of his office as a holy service to his people. His chief concern was to follow the Christian vocation to holiness also in his political actions. For this reason, his thoughts turned to social assistance. The cause or campaign for his canonization began in 1949, when testimony of his holiness was collected in the Archdiocese of Vienna. In 1954, he was declared venerable, the first step in the process. The League of Prayers established for the promotion of his cause has set up a website, and Cardinal Christoph Schx�nborn of Vienna has sponsored the cause. On 14 April 2003, the Vatican's Congregation for the Causes of Saints in the presence of Pope John Paul II, promulgated Charles of Austria's "heroic virtues." On 21 December 2003, the Congregation certified, on the basis of three expert medical opinions, that a miracle in 1960 occurred through the intercession of Charles. The miracle attributed to Charles was the scientifically-inexplicable healing of a Brazilian nun with debilitating varicose veins; she was able to get out of bed after she prayed for his beatification. On 3 October 2004, he was beatified by Pope John Paul II. The Pope also declared 21 October, the date of Charles' marriage in 1911 to Princess Zita, as Charles' feast day. The beatification has caused controversy because of the mistaken belief that Charles authorized the Austro-Hungarian Army's use of poison gas during World War I, when in fact he was the first, and only, world leader during the war who banned its use. On 31 January 2008, a Church tribunal, after a 16-month investigation, formally recognized a second miracle attributed to Charles I (required for his Canonization as a Saint in the Catholic Church); in an uncommon twist, the Florida woman claiming the miracle cure is not Catholic, but Baptist. "I have done my duty, as I came here to do. As crowned King, I not only have a right, I also have a duty. I must uphold the right, the dignity and honor of the Crown.... For me, this is not something light. With the last breath of my life I must take the path of duty. Whatever I regret, Our Lord and Savior has led me." Addressing Cardinal Jx�nos Csernoch after the defeat of his attempt to regain the Hungarian throne in 1921. The British Government had vainly hoped that the Cardinal would be able to persuade him to renounce his title as King of Hungary. By the Grace of God, Emperor of Austria, Apostolic King of Hungary, of this name the Fourth, King of Bohemia, Dalmatia, Croatia, Slavonia, and Galicia, Lodomeria, and Illyria; King of Jerusalem, Archduke of Austria; Grand Duke of Tuscany and Cracow, Duke of Lorraine and of Salzburg, of Styria, of Carinthia, of Carniola and of the Bukovina; Grand Prince of Transylvania; Margrave of Moravia; Duke of Upper and Lower Silesia, of Modena, Parma, Piacenza and Guastalla, of Auschwitz and Zator, of Teschen, Friuli, Ragusa and Zara; Princely Count of Habsburg and Tyrol, of Kyburg, Gorizia and Gradisca; Prince of Trent and Brixen; Margrave of Upper and Lower Lusatia and in Istria; Count of Hohenems, Feldkirch, Bregenz, Sonnenberg; Lord of Trieste, of Cattaro, and in the Windic March; Grand Voivode (Grand Duke) of the Voivodship (Duchy) of Serbia. "The Last Empress, The Life & Times of Zita of Austria-Hungary 1892-1989" by G.Brook-Shepherd 1991,ISBN 0-00-215861-2.